I love black bean sauce and chilli bean sauce. Not had a recipe for yellow bean sauce on the blog yet. There are quite a few yellow bean sauces in various chinese names as 麵豉醬/豆瓣醬/黃醬and there is also a sweet bean sauce 甜麵醬. 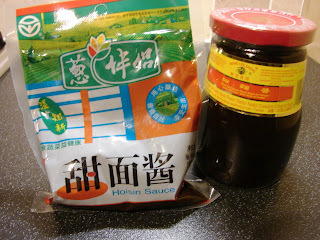 Sweet bean sauce is made with fermented soya beans and wheat flour, it is the main ingredient for hoisin sauce, some brand of sweet bean sauce is called hoisin sauce like the plastic packet as shown on the picture. All the yellow bean sauces and sweet bean sauce are interchangeable and taste very similar. Sweet bean sauce has a sweet taste as the name suggested. The following are two brand of sweet bean sauces I got at home. 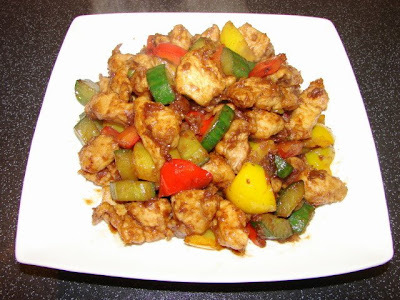 This chicken dish in chinese is called 醬爆雞丁 (jiang pao ji ting), a famous Beijingnese dish. The recipe is rather simple. Cucumber is the common vegetable added. Some recipes use green pepper and some use bamboo shoots. Garlic and Shaoshing wine are not normally used but if you like it you can add some. I added red and yellow pepper for the colour. In a wok or large frying pan, heat the oil till very hot, drop the chicken in, stir and let it fry for about 1 minute or till the meat has turned white, but not necessarily cooked through. Take the chicken out and drain off the excess oil. This process is called velveting. Remove all the oil but leave about 1 tbsp. Add the ginger and spring onion and bean sauce, stir till fragrant. 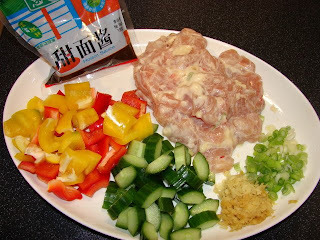 Add chicken and vegetables, stir fry for few minutes till vegetable are tender and chicken is cooked and well coated with the sauce. Add pinch of sugar and dash of soy sauce to taste. Looks very good. Thanks for the feedback. I have not made this for ages think this could be a calling.